My thoughts on Paterson will have to wait until we run A.A. Dowd’s review of the film. So what else have I seen lately? Pablo Larraín’s widely fêted Jackie struck me as over-determined and textual, like a Todd Haynes movie without a sensual side. Say what you will about Haynes’ academic commentaries and significations of repressed desires, but at least they’re always related through his fascination with glamor, mystique, and period forms. It even has a couple of Haynes-esque aesthetic devices; it’s shot on grainy, anachronistic Super 16mm and is partly structured around a studious recreation of the black-and-white 1962 TV special A Tour Of The White House. Out of curiosity, I ended up watching it after Jackie. (It’s on YouTube and less than hour long.) The director was Franklin J. Schaffner, who went on to make Patton and Planet Of The Apes. I know his extensive work in TV in the 1950s and early 1960s—which included almost every episode of Edward R. Murrow’s celebrity interview show Person To Person—mostly through its reputation for interesting camerawork, and though A Tour Of The White House is fairly dull, it manages a few stylish dolly shots that would be unthinkable for a modern TV program. Larraín and screenwriter Noah Oppenheim of course zero in on its period-specific awkwardness, in keeping with their dry conception of the first lady as a fractured performer. Speaking of trauma, red dresses, and movies that are named after the central character: I finally caught up with the micro-budgeted Krisha, which, like Jackie, is much admired by my colleague A.A. Dowd. My experience with the film was sort of the opposite of how I felt watching Jackie, though in the end it was more or less the same reaction. 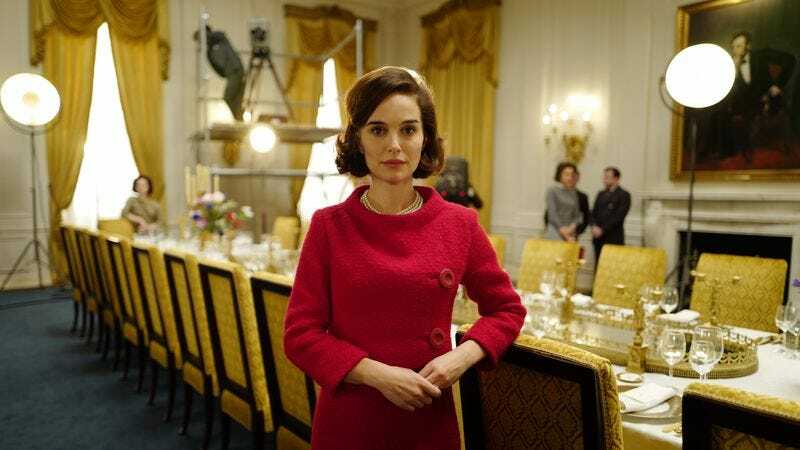 Jackie turned me off with its inert and heavy-handed framing narrative (in which the widowed Jackie Kennedy is interviewed by a Life reporter), though I came to appreciate some of its most claustrophobic sequences. Krisha hooked me with its first very long Steadicam shot, which follows the title character as she arrives for Thanksgiving with part of her skirt stuck in the door of her pick-up truck; goes to the wrong house; makes her way to the right one; and is finally reintroduced to the family that hasn’t seen her in years. But gradually, it becomes clear that writer-director Trey Edward Shults (who also plays the protagonist’s estranged son) can’t develop the drama beyond that first engrossing encounter with family tension; the final stretch is something of a shambles, and Shults’ use of music and changing aspect ratios only contributes to the sense of randomization. Coincidentally, earlier in the week I watched Stony Island, the debut feature by Andrew Davis, the director who would go on to launch the career of Steven Seagal (whose latest garbage movie I reviewed this week), on which Shults’ aunt and star, Krisha Fairchild, is credited as a production assistant. Stony Island is no great shakes, though it does afford a chance to see late ’70s, mercury-vapor-lit Chicago as filmed by Tak Fujimoto, a perennially under-appreciated cinematographer best known for his work with Jonathan Demme and M. Night Shyamalan. Man, do I sound like a sourpuss this week, or what?